FLOW CALIBRATION UNIT FOR BLACK EDITION PUMPS BENEFITS WITH USING XAVITECH FLOW CALIBRATION UNIT - Easy caliration of pump flow - Shorter R&D time - Reduce power consumption with correct flow calibration - Reduce pump noise FLOW CALIBRATION UNIT Xavitech can supply calibrated pumps according to customer needs. Just as important, the cus- tomers can also adjust the pump performance themselves. This is really valuable during the design phase of a system since the user will be able to compensate for condition changes simply by reprogramming the pumps. Once the system layout is fixed the customer can inform Xavitech on which pump setting was the best. Hereafter, Xavitech can easily supply calibrated pumps according to the new requirements. Such a procedure implies a quick production transfer which saves time and costs for the user. The flow calibration unit will enable the user to adjust the flow through altering the pump frequency and store setting permanently into the pump memory. 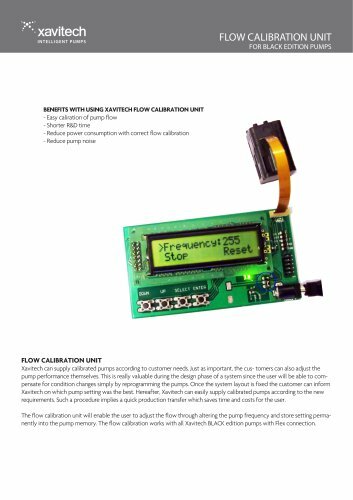 The flow calibration works with all Xavitech BLACK edition pumps with Flex connection.